PHILADELPHIA, Pa., March 15, 2016 /PRNewswire/ - Top B2B Publisher Network, RevResponse, is announcing the launch of their fully redesigned content library website, TradePub.com, paired with powerful new engagement and publisher earning trends. 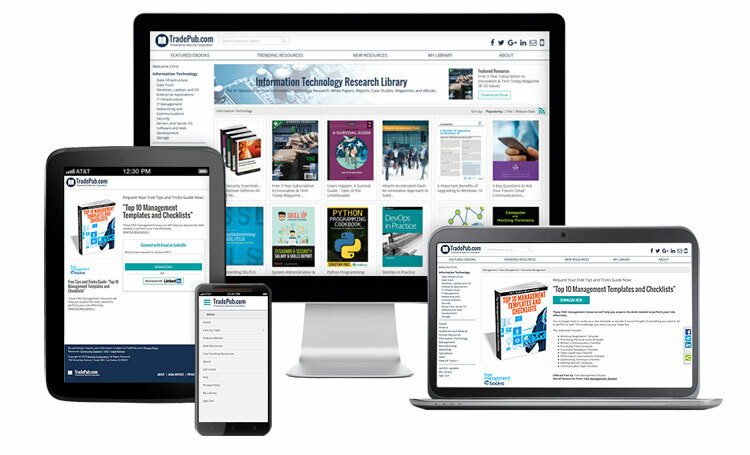 TradePub.com hosts the largest database of professional and technical research and is the destination site for millions of RevResponse publisher promotions. Dedicated to advancing monetization efforts, RevResponse developed a new content library focused on improving user experience and optimizing earning potential for publishers. Servicing more than 29 million content requests from users seeking professional resources, RevResponse applied an audience-centric approach to drive the redesign by identifying key audience personas and popular user flows impacting all publishers. In this approach, the content discovery process became the main focus of the TradePub.com redesign. From the most simplistic improvement of increasing content cover graphics by 80% to implementing new algorithm-based content recommendation modules to dynamically target by user persona, the user experience was overhauled. In addition to these content focused elements the website was converted into a fully responsive destination allowing for a multi-device experience for all users. "We entered this initiative with one primary goal: let the content do the talking and get out of the way," said David Fortino, VP Audience Development, NetLine Corporation. "Playing the role of a content conduit to our discerning audience is a responsibility we carry with us daily and it's an honor to represent some of the world's greatest brands in their various audience outreach endeavors." Early analysis of the redesign is telling a compelling story for this audience focused approach by RevResponse. The full suite of enhancements produced a more powerful and compelling content request flow for all users. By improving the methods for content discovery RevResponse increased the average content request count per active user by 30% and increased the revenue generated per active user by 12%. The TradePub.com mobile audience responded to the new streamlined mobile menu and page design with a significant improvement in engagement including bounce rate reduction of 10% and pages per session increase of 20%. "The use of more prominent imagery, predictive search technology, targeted recommendation modules, and instant download capabilities has resulted in a highly immersive experience that has enhanced our audiences' ability to engage with and consume professionally relevant content. We'll continue down this path of iterative improvements based on serving the needs of our audience, publishers, and content contributors." RevResponse is dedicated to providing the most advanced audience monetization platform for publishers. The TradePub.com redesign is the most recent initiative made by RevResponse in optimizing the audience's experience and publisher earning potential. A true testament to the relationship of user experience and monetization, this redesign has proven the combination of an audience-centric approach and the power of content to be the winning formula.